This week seemed to have passed by in a blur. I took a slow and easy run on Monday night with the fun run group. Tuesday night’s run was at the same place as the Monday fun run. Thursday, I met up with a different local group for their social run. Saturday, I ran 10 miles. Sunday was a day off instead of recovery run. Tuesday, I ran with a mentor that I don’t think I had run one on one with before. I was trying hard to push myself and she made it easy to keep going by being positive and reassuring. The goal was to run hard for the 3 miles between a warm up and cool down mile. I made sure to do that, but am glad I had someone with me to reassure me that I could slow down once I completed 4 miles. When I mentally wanted to stop, I bargained with myself that I could once I reached that mark. Thursday, I drove up to a nearby lake to run with a group that does their social runs on Thursdays. I was able to find someone in my training group to run with. We saw deer on the trail and the lake was a pretty backdrop for the run. It was a nice, new place to have a run. I got to have a post-run cheeseburger and beer with some other people who are runners. I saw some people I already knew and I met a couple of new people. I didn’t do or say anything embarrassing, so I say that is a win. Friday, I was feeling nervous about the planned run for Saturday. 10 miles is a big deal. In the middle of the day, I prepared lasagna and put it in the fridge for later. I chopped veggies for salad. I even made a peach crisp for dessert. I was so excited about the lasagna that I’d used an italian pork that I typically use for larger groups. It was not good. I had a few bites of it, decided I didn’t want any, and ate mostly salad with garlic cheese bread for dinner. The peach crisp was a delicious way to complete dinner. Saturday morning, I woke up early and ate my whole energy bar. My tooth was nagging me with pain and I’d discovered a small fracture along the back that was loose. It was unpleasant, but I set out to put my stuff in the car and heard rain start falling. I rolled my eyes , realized I needed to go back in for one last bathroom break to avoid having to use a portable bathroom, and then set out on my journey to do 10 miles. The course divided into a 6 mile run north from the park we met, and a 4 mile run south. The first 6 miles was with a group of 5 women. It was very much like when driving tired and you’re not sure how you got from one point to another except that auto pilot must have been on. This worked to my advantage for the next 4. Our group got separated at the meeting point. I went on with completing the next 4 miles with a mentor from my group and one from a different distance group. While we were running, we discussed my pace and I assured them that I’m usually breathing heavy and a good indicator that I’ve run too fast is if I pass out (I was joking, of course). I could still run at a good pace after the distance we’d run and I actually got my fastest mile [on my newer GPS watch] during my 8th mile. I went on to have an iced coffee with people from the group later. I went home, took something for my tooth and took a rather long nap. I wouldn’t have started this group had it not been for the kindness of the owner of the running store I’d gone into to buy headbands. I was running casually and trying to train for a 5k race. I found out the store had the type of headband that didn’t slip. She invited me to come to a fun run. I showed up for the fun runs, then she invited me to come to their Ladies’ Night Fun Runs. I started doing that, then I found out they had programs to train for races of all kinds. This training program has been an amazing experience. I can’t believe it’s been 8 weeks already. I used to tell people I would never run for fun. Now that I do run, I can’t imagine not doing it. I want to go farther, faster, and be better at it. I’ve lost about 25 lbs since the beginning of the year. Most of it has been since the running program began. I do not have a slender physique. Many people wouldn’t peg me for someone who likes to work out. I don’t care about that. I have a runner’s body because I run. This is a runner’s body and it’s mine and you can’t diminish that. Having said that, I’m not running 13.1 to lose weight or to get skinny. I am running it to take my focus off of how my body looks and see what it can do. I started running to lose weight. Now I do it for health. If I lose weight, that’s great. I want to celebrate that my body is capable of running 13.1 miles with training and I will celebrate that victory. I haven’t become a supermodel in 8 weeks and I won’t suddenly shed the pounds in the next 4. My body and I will have accomplished a feat that so many others haven’t. Of course I still have body image issues. I do think it stinks that I don’t look on the outside how I feel on the inside. I’m just trying to shed the “I wish” mentality and adopt a “I’m glad” one. This week, I’m running hills on Tuesday and 11 miles on Saturday. How did you do this week? Did you have any hurdles in the process of your fitness journey? Are you struggling with body image issues that impact your goals? Welcome back! The training plan calendar I have goes 12 weeks and week 7 has just been completed. I ran 25.1 miles last week. Monday evening was a fun run where I got to try Newton brand shoes. I felt like giving up almost as soon as the run began, but I made it 3 miles and I actually tried to run a few fast spurts. I got some free socks out of it and my husband was there with me for the run, so there were some bright spots. Tuesdays during the training schedule are for group training sessions. Our group had 5 miles to run. The weather made the group run canceled due to incoming dangerous storms and lightning. Initially, it looked like the storm decided to skip our town since we’d canceled the run. About a half hour after we’d normally be out running, the storm came with a lot of thunder and lightning. So, I put it out on our group Facebook page a time and place that I’d like to meet to make up the run. Another member of the group needed an earlier time, so we agreed to meet at a park at 5am. Wednesday morning, I got up before 5am. I ate a few bites of my energy bar, drank a little water, and headed out with my running flashlight to get 5 miles in. There were 4 of us. We ran in the dark for the first half of the run. The sun started to give us some light for the second half. I had actually gotten up earlier than I ever have before for a workout. It was a bit of a sleepy day, we completed the run early on. Thursday also had 5 miles scheduled. The plan to run Wednesday morning was so that I could run Thursday evening and feel like I’d taken enough time off in between. It mostly worked. I was joining Fleet Feet for a promotion involving getting as many people together running as possible for 1 hour to get as many miles logged as possible. My husband brought the kids and they mostly walked the trail. I went to the halfway point for 4 mile runs and turned around to run the other mile around a lake near where we had parked. When I approached my husband and kids from behind, my 5-year-old son tripped and fell flat. He scraped his elbow and knee and was screaming pretty loudly. My husband told me he had it taken care of and to keep running. I looked at my watch and still had about 3/4 of a mile left, so I trotted off and then ran my last bit faster than I intended so I could catch back up to them. My legs were not pleased when I finished, but I walked around for a little while after I finished so I’d be moving the full hour. Thursday was also the first time we’d dropped our youngest (3 years old) off for school. It was just for an hour, but it was rough. She did not want her dad or I to leave. It took awhile to get her to let us go and I choked back tears while her dad held her and encouraged her to go make new friends. She’d gone with me every day her brother had school last year and knew we always come back. She even has the same teacher he had the last 2 years. She did not care and didn’t want us to go away. Since she’s only going 2 days a week, she’s going back Tuesday and keeps asking me if I’ll be waiting for her in the parking lot all day. Yikes. Friday night, we had pasta for dinner. I devoured spaghetti noodles doused in meat sauce and cheddar cheese. I thinly sliced peaches and put cinnamon sugar on them. I downed a bunch of water. I was hoping for a really good 9 miles on Saturday. Saturday morning, I ate my energy bar and set out to run a 5 mile loop followed by a 4 mile loop. I thought that I wouldn’t want to stop at the 5 mile loop stop because I’d just want to get the other 4 over with. I actually needed the stop to pick up an electrolyte drink because I was getting a headache. I set out on the second leg of the run and was with a group of people who were keeping a good pace. By the time we reached the last mile, I looked down at my watch and I couldn’t believe I was just talking and running and not trying to find a reason to stop. I was really glad when it was over, but I didn’t feel like I couldn’t go on. I felt like I was just getting it done so I could go on to the next thing. It was nice and unexpected. Afterward, I had my celebratory coffee and conversation with people from the group that wanted to join. My family and I went out that day and walked around a festival. I logged over 22k steps on my pedometer by 2pm. I napped a little after that because I was pretty sleepy, but it was a good feeling of accomplishment. Sunday, I set my alarm to get up and go on a social type of run with a different group. I knew as soon as the alarm went off that I wasn’t getting up just yet. One side of my face felt full and achy. I took decongestants and allergy pill and the combo just made me exhausted. I spent the rest of the day in a fog. Somehow, I still managed to get on my running gear in the evening and my husband set out to go 3 miles slow and easy with me. He didn’t wear his headphones and we exchanged conversation while we ran. It was nice to have stories to share with him. I’ve stayed at home for 5 years and we’ve lived in a new place for almost 4 years. This is the most socially active I’ve been since I stopped working. He has expressed that he’s glad I joined the group and has noticed how good it has been for me to socialize again. Funny, I just thought I was getting physically fit. As it turns out, I really enjoy being around people who like running, too. No, I’m not cured of depression, but it doesn’t hold me down as much. I’m not where I want on the scale, but that isn’t my current goal. My current goal is to run 13.1 miles and I’m almost there. This Saturday, 10 miles. Next will be 11, and then we’re doing a practice run of 13.1 (yes, skipping 12 miles) on the real course. Eeek! So only a few weeks until I know I can do it, then a couple more weeks until I do it in a race setting. I’m actually really excited about it!! Have you noticed any changes beyond physical ability since you started trying to get fit? Are you working toward your goal still? Blisters, bloating, and chaffing…oh my! I ran 20.14 miles last week. My husband was out-of-town on business Monday thru Friday. I was in the middle of a medication adjustment. I was mentally and physically exhausted the entire week. Being on the tail end of a medication adjustment and having all 3 kids to myself was unpleasant to say it nicely. There were a lot of appointments to get to and other day-to-day things to attend to. One of my kids is a teen and we’re often in conflict. This week was no different. She helped out a couple of times by keeping an eye on her younger siblings so I could attend to training, though. Tuesday, training was 4 miles including hill training. The group ran up and down a large hill 6 times. I lacked the energy to run to the turnaround spot each time we reached the peak of the hill, so I walked a bit at the top of the hill. I didn’t walk very much on the hill, and I think that was impressive. While we were running up and down the hill, I was listening for tips and tricks from the experienced runners. One of the best tips I got from a mentor was pretty simple. No shuffling. Women are especially guilty of this running form faux pas. So, on the uphill, rise each step as if you were ascending stairs. Lift the knee enough to overcome stairs that aren’t actually there. Then, on the way down, make sure you aren’t letting your legs too far in front. There is the ever important arm pump involved in all running that helps with uphill, too. Pump your arms a little harder when you’re trying to make it up. Thursday, it was hot outside and I’d arranged for the teenager to watch the kids in the evening for me to complete my assigned 5 miles. Wednesday, the teen expressed that she wanted to sleep over at a friend’s house. After an early afternoon appointment, I set out for the dreaded midday heat run. The temperature was around 90 degrees (F). Once I reached one half of a mile, I started to feel like my stomach was cramping. I first ignored it, but realized that anything I might need to do could not be put off until I completed a 5 mile run. I turned back toward the house, took care of my bathroom needs, and headed out to run the remaining 4.25 miles. I felt considerably tired the entire time. At one point on the trial, two girls around the age of 10-12 years approached me from the opposite direction on their bicycles. One girl loudly chanted “oink, oink.” When her friend said, “huh,” she pointed to me and said more loudly than before “OINK, OINK!” Her friend or sibling still looked confused and I didn’t give any indication or satisfaction of knowing I could hear them despite my headphones. I ran along thinking about how I wished I didn’t have such a fat belly. Then, I forced myself to use my eyes to take in my surroundings and my ears to listen to my music so both could drown out the negative thoughts in my head. I had my handheld hydration with me. I sure needed it, but I managed to fasten it too tightly and give myself a nice blister on the thumb knuckle on the side of my index finger. Bandages are not easy to keep in that spot or any spot on the hand. I finished my run even though I was slow, my stomach told me it hated me in the first half mile, and I am pretty sure I heckled by children. When I took off my shoes, the tips of my toes on my left foot were white from blisters. The part of my chest under the sports bra was chaffed and bright red. As it turned out, my teen didn’t have a sleepover that night and I probably could have put it off until the evening. My husband returned Friday afternoon. Saturday morning, I nervously woke for the group 8 mile run. I ate my energy bar peacefully and went to my local Fleet Feet for our run. They had samples of nutrition things that we could take on the run with us, so I popped one that had raspberry purée in it into my hydration belt that had 2 frozen sports drinks in the flasks and my phone tucked away. I brought my bluetooth headphones along for when I had time alone on the trail since the run was so long. I normally don’t wear them when I’m around a group for our training or for races because I usually find someone to talk to, listen to, or just run quietly with. This is a recent development since I used to always run with music. Now, I refer to it as my “binky.” I have the headphones for comfort when I expect something that might call for their use. I started out on the run with two women, Barb and Jane. We started out with a warm up mile that Jane encouraged us to hold steady when we started to hang back. She also said we were going to hold a specific pace for the rest of the run that day. I thought she was crazy to think I’d go 10:30 for the next 7 miles. Then, I thought she was trying to kill me. Then, I was happy someone was running along with me because the benches were starting to call my name to just lay there and pass out. I wasn’t hallucinating, even though I thought I saw the Gateway Arch through the trees at one point. Perhaps because I’d felt like I’d run 160 miles. Jane kept me on pace and offered advice when to stop to have some of the nutrition that I’d brought along to sample. We stopped about every 3 miles for a quick rehydration. I found myself sipping from the bottles on my belt when I felt especially warm, but the nutrition seemed to work as intended. Near the end of the path we ran, there was less shade to linger in and the heat was making me feel defeated and worn down. I wanted to stop, but I wanted to go 8 miles. Most of the time, I kept my composure, but I let out some “I can’t do this” whining between my labored breaths. Jane was calm and reminded me that I was almost there and that I was already doing it, so I couldn’t just stop. She kept reminding me that the run wasn’t all physical and that it was an exercise for your mind. I finished 8 miles. I walked back to the store without collapsing. I sampled the different choices we have for running nutrition. I found out that I like lemony tasting stuff, but not apple flavored. I will still have to work out what is the perfect formula for me on long runs. After 8 miles I didn’t know I could finish, I walked over to get coffee from the big coffee chain near the running store and had fun conversation with fellow runners. I spent a few hours at the pool with the kids walking. I did plenty Saturday and didn’t think too much about how I’d completely exhausted myself fairly soon after I woke up that morning. I ran 8 miles. That’s the farthest I’ve ever gone on a run. I’m proud and have a right to the pride. There’s no humble about that. I did it and I’m bragging because I’m proud. Sunday is the day of the slow recovery run. I didn’t get out in the morning to run. I waited out the hot sun and headed out around 8pm. I haven’t run at night in a few months. It was a nice change of scenery. I wore my shorts, which I normally don’t do because people seeing my thighs isn’t my favorite. I learned not to wear shorts anymore because my thighs are so mean to each other (chaffing). I looked up at the stars a couple of times and once I was walking to cool down, I picked out stars and constellations I felt like it had been too long since I’d seen. Last week was difficult. I would not do it over the way it was and I would not do it over differently. I started my new medicine a few days before initially planned. I had some pretty upsetting disagreements with my teen where she lofted some mean words my direction while I was feeling fragile. I had to push those things away to complete the longest run I have ever done. I had to push “can’t” out of my vocabulary when talking about my physical abilities. I had to actually exercise my will power and mental strength. That was harder than anything physical that I’ve achieved so far in my training. 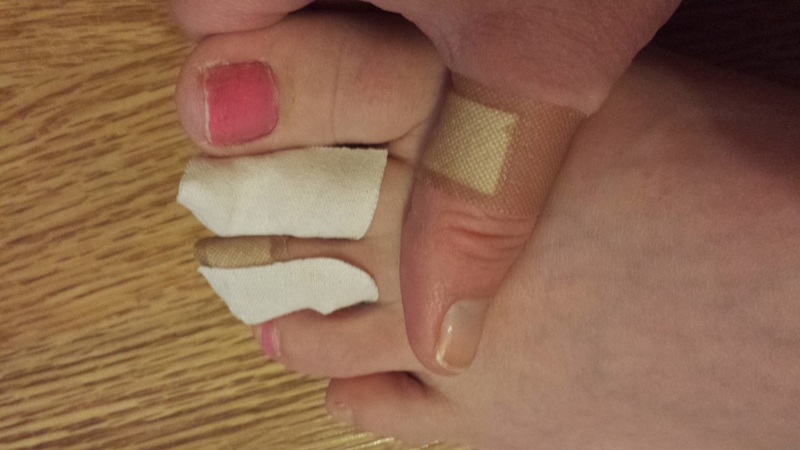 I’ve included a pic of my current toe situation to heal the existing blisters and prevent any further blisters. I’ve got some healing chaffing where my sports bra got me and I’ve purchased a product to prevent that from happening again. My stomach has been puffy and bloated for 2 days. I have chaffing on my thighs from my Sunday run. I’m just a mess, but I love it. I’m learning so much about what my body is capable of and I’m impressed. Do you have any new battle wounds? Are you struggling with mind over matter? Is there a challenge within yourself that you’ve come to recognize? Are you convinced that I’m nuts? Thanks for reading. I love hearing from readers. What do you want to see me write about as a newbie to distance running or a mom that has depression? Do you have a story you want me to see that would help with my journey and maybe some other people also? I’d love to know! This blog is for my readers, too! I enjoy and appreciate your encouragement, also. Have a great week! I ran 21.5 miles in my 5th week of this training program. From the time I started using Nike+ for tracking my runs in 2013, my longest run was 6 miles in one day. This Saturday, I ran 7. I didn’t run 7 miles without stopping. I didn’t run/walk 7 miles. I ran a 5k race, ran a mile with someone in a training program that only required they run 4 miles that day, then ran 3 miles with an owner of the running store that is hosting the training program I’m in (and a few others). I think that was pretty cool of her to do since she’d also run the same 5k race and I was late to return to the group to finish our miles as we’d planned to ahead of time. That was the highlight of this week in training. I outran myself. I didn’t place in the 5k. I ran a time I usually do in 5k races, but wasn’t able to beat my record of 30:01. My goal has been to get under the 30 minute mark. I ran farther than I ever have before one day, then I got out and ran 3 miles the next day. I’m here to type about it today, so I’m capable of doing it. There wasn’t much in the way of exciting moments on my other runs this week. I ran a little faster than my most recent averages on my 4.5 mile Tuesday run. I enjoyed the help of a mentor to bring me to the finish the last half mile. Sunday’s 3 mile run after Saturday’s 7 was rough at first, but I actually finished up feeling good about it. It was humid and I’m pretty sure there was a little misty rain that I was too sweaty to feel. I also ran a weird route because I didn’t plan and had to add a few loops to make the miles add up right. I’ve lost 19 lbs over the past few months. Around 10 of those have been since I started my training. I’ve eaten better for a while and I’ve been more active. My goal isn’t focused on the scale now. Part of the reason for joining a program to run 13.1 miles was to take my focus off of the number on the scale. It is working in that I’m focusing on getting better at running and pushing myself to go harder,faster, and farther. It hasn’t removed the negativity involved in my body image. I have a long way to go. I see myself in photos and feel ashamed of my midsection. I see nothing but my belly in the pictures. I wonder why this has taken me years to lose such a small amount weight and beat myself up over it. If that doesn’t seem like the person I project myself as, then I’m glad for that. I don’t want to seem unhappy. I sometimes get caught up in being disappointed in my faults instead of relishing in my strengths. That explains why I don’t often miss the opportunity to pat other people on the back. I’m more confident that I can run a half marathon. I’m a little concerned about my hill workout tomorrow since it involves no cool down between uphills and involves 4 total miles. I’m actually more concerned over that 4 miles than I am 8 miles on Saturday. Good luck to you in your fitness journey! Did you surpass yourself in anything yet? Best time, heaviest weight, longest distance, most reps are all things to pat yourself on the back for. Don’t forget to celebrate your little wins. Week 4 done and on to week 5. I’ve had a few experiences so far in this journey. My laptop that I’ve had for about 6 years was acting up, so I switched to using my husband’s primarily and this version of Windows is not meant for the laptop experience. That’s been a learning curve. I feel like I started a new job and have to re learn the system. I finally put all of my pictures and recipes to Google Drive. That’s probably not the journey you’re looking to read about today. Tuesday was a group workout day. The challenge was hills. It was really one steep hill that people use for sledding when snow is in full swing. My group ran up that hill 5 times in a row. Thanks to having people there to mentor the group, I didn’t stop and walk or roll down the hill at any time. I kept moving forward and only mumbled expletives occasionally. It was humid and gross outside, but it could have been worse. There was a midday storm that lowered the temperature outside enough to make it a little more bearable than if it hadn’t rained. I suppose the hill workout from Tuesday made my run on Thursday easier to handle. I didn’t feel as challenged by the smaller hills along one of my usual routes. I observed the need to relax on Friday to get ready for the long run on Saturday. Saturday was 6 miles. That is the furthest I’ve run since I started about 3 years ago, but I was still a little tentative about doing it. I set out a little faster than I intended, so I deliberately slowed down until I passed my first mile. When my watch beeped for mile 2, I was pleasantly surprised that I had completed another mile already. I ran my 3rd mile with a mentor from the group and I got a 2nd wind and took off from where we turned around. I was feeling energetic and was trying to get faster with each mile as the training plan said. I felt good and when I started to feel tired, I managed to stay strong and not start walking. I did the 6 miles and I gradually sped up and slowed down in the last mile. I was pretty tired the rest of the day and I actually was having to try harder to hydrate than previous long runs. The temperatures Saturday were cool compared to the hot and humid days that we’ve had here in Central Illinois. I still sweat a lot, though. This is where I talk about bodily functions if you don’t want to look. Every time I went pee for the few hours following my run, it was pretty yellow. I carried a water bottle on my run with watered down sports drink in it. I drank all of it along the route and once the run was complete. I drank more electrolyte drink when I got to where I’d parked. I drank a bottle of water when I got home. It was a few hours later that I finally got back to my usual light color of urine. I think I ignored my habit of drinking plenty the day before my longer runs. Either way, nothing bad happened because I followed the cues from my body to make sure I take care of myself even though I’m putting my body through this training. Sunday was a 2 mile run. I put it off all day. I’d set an alarm in the morning. That was too early. I was outside in the early afternoon and it was too humid. I finally set out after dinner time. It was a good thing it was only 2 miles because I’d somehow lost my appetite and didn’t eat anything but a few pineapple slices for dinner. The challenge was to run as slow as possible. I set out running uphill away from my house and was going at a pretty good pace. I slowed to a jog and I kept having to slow down to stay at the pace I was shooting for, which was 13 minute miles. It was nice to get out and run. Now I’m on week 5 of this journey and I’m excited to see how I feel this coming weekend. I’m running a 5k on Saturday morning, then finishing the other 4 miles to get 7 miles in for the day. Fortunately, there are other people in the group doing this or I probably wouldn’t be trying to. Have you learned things along the way on your own journey? Did you learn new things about your body like how well you tolerate certain foods along with your fitness or how much you need to drink to replace what you sweat? Thanks for reading!